A garden pond provides depth and beauty to just about any landscape. However, keeping these ponds crystal clear is a constant fight against algae. One way that you can help defeat this enemy is by installing ultraviolet lights in your pond. They operate inline with your filter system and kill the algae by using ultraviolet light. Installing will take a couple of hours, but the spectacular results for your pond's clarity are worth it. 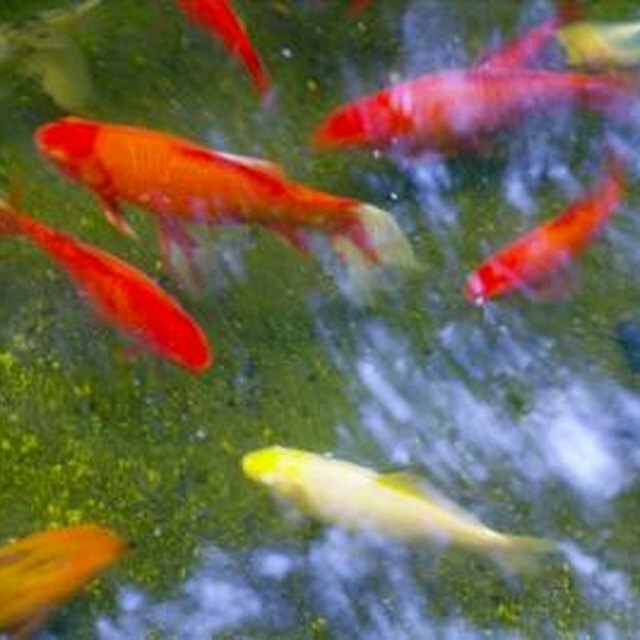 Ultraviolet lights can help keep your pond crystal clear. Measure the size of your pond in gallons. This will determine the wattage of ultraviolet (UV) light that you need to effectively treat your pond. For ponds up to 400 gallons, you need a UV light with a minimum of eight watts. For ponds between 400 and 800 gallons, you need a 15-watt bulb, while ponds over 800 gallons require a 25-watt UV bulb. If your pond size is just at the edge of the recommended UV, use the next higher wattage. Purchase the appropriate UV filter for your pond size. In addition to the minimum wattage above, UV lights come in many shapes and sizes, depending on your filter connection and the flow rate of any water feature (waterfall, fountain) where the UV light is attached. Also keep in mind the plumbing size of your pond installation. For example, if you are using 15-inch plumbing in your pond, purchase a UV light that comes with 15-inch sockets. Ensure that you have an outlet available for the UV light. Most lights in the United States require a 120V circuit. Turn off the pond filtering equipment and any pumps that are running. If you have a drain valve, open this so that the water drains out of the pond plumbing. Find the filter outlet line. You want to install your ultraviolet lights in line after the filter, but before any water features, such as a waterfall. Cut into the filter line, using a hacksaw if you are using PVC plumbing. Install the UV lights by attaching the filter outlet line to the input of the UV light. Connect the other end to the input line of your water feature. Again, the type of connection and the size depend on your particular water plumbing installation. Use the PVC cement to attach and valves as needed. Turn on the filter and any other pond equipment. The ultraviolet lights will begin working immediately. If installing in a new pond installation, allow the biological filter to run for a day or so before you turn on the UV light. This will allow a healthy colony of beneficial bacteria to take root in your pond ecosystem. Always use caution when working with water and electricity. Plug your ultraviolet light into a GFCI grounded outlet. This will help prevent electrocution if any leaks in the circuit develop. What Size Pond Filter for a 300-Gallon Pond?